Walt Disney originally wanted to revive Fantasia on a continual roadshow basis, revising the film by adding and subtracting animated segments so that the film could perhaps be an evergreen film attraction, the equivalent of a touring variety show or a music hall all trussed up as High Culture because it was classical music. Amateur Disney psychologists would quickly point out that this was the first appearance of the impulse to revise which led to Disneyland, but for now let's simply consider these films seriously in a historical context. Historically, Disney commentators have essentially had two reactions to the period from 1943 to 1949: that either these films weren't really worthy of appriasal because obviously Disney was "coasting" by failing to make a feature film story, or that the films were simply "better than expected" (which still implies that they aren't that great). But for a moment let's dismiss these from the context of the lean, wartime years of the studio and do something commentators usually only do for Disney when he makes something they actually like: take him seriously as a creative force. Fantasia was one of Disney's babies and he was crushed when the general public, the only real audience he took seriously, reacted to it with obvious apathy. And although he swore to not repeat the experiment again, everybody has seemingly ignored that he did, in fact, repeat the experiment, but not until after retreating to the environmentalist fable Bambi and the unexpected success of Dumbo. That Dumbo was the only film he didn't oversee personally and that it had been his only true success since Snow White must have been exceedingly damaging to Disney personally, and in some ways, he did retreat. He retreated to his best idea, the Fantasia omnibus concept, but this time, instead of high culture imported from Europe and Russia, he would give them high entertainment from the home front. In concept and execution Saludos Amigos, Make Mine Music, Three Caballeros, Melody Time, Fun and Fancy Free and Adventures of Ichabod & Mr. Toad are Fantasia films done in that mode. But there would be changes. Now instead of Stokowski, Bach, and Beethoven, Disney would have The Andrews Sisters, Dennis Day, Bing Crosby and Freddy Martin. Instead of the deadening duration of Fantasia - over two hours - the films would clock in at just over an hour. And the atmosphere and strength of the presentation of Fantasia would be supplanted by a frantic pace and bawdy humor. These Post-Fantasias are divided up into three pairs of six, with two "Latin America" films which take the form of travelogues, two split-feature films of longer duration shorts, and two true "Post-Fantasias". These two - Melody Time and Make Mine Music - are nearest in concept and execution to Fantasia, with meatier narrative shorts interspersed with shorter abstract pieces, some done in limited animation. There is no effort towards a larger cohesion, and no disguising of the fact that the audience is really just supposed to enjoy the music. The narratives are brief and simple, and rarely reach for a complex set of reactions from the audience. Those that do have become minor classics, while something like Make Mine Music's "Blue Bayou" is best forgotten aside from the fact that it lent it's name to a famous eatery. The best segments of these were often broken off from the whole and televised or released to video separately: only recently have consumers been allowed to see the whole of The Adventures of Ichabod & Mr. Toad, for example, despite the familiarity of that film's two segments to anyone who grew up with a video player or cable. The bittersweet climax of Make Mine Music, "The Whale Who Wanted to Sing At the Met", is recognizable enough to have appeared in the preshow area of the attraction 'Mickey's Philharmagic' to general recognition, and the separate Melody Time segment "Once Upon a Wintertime", with its' Griffith-esque climax on the ice floes, was a staple of the holiday season on the Disney Channel for years. Both of the films are fairly inadequate; they never build a very good sense of pace or incident, and without the concert framework which anchors Fantasia the pieces play as an hour block of short subject programming, not a satisfactory film. They lack the true sense of setup and payoff, even rudimentary, provided by the other compilation films, and they fail to maintain a consistent and appealing meter. The most frantic segments follow the most sedate, and instead of feeling like appealing variety, all the sense of fun is deflated. This is not to imply that they do not have their moments of true grace; Make Mine Music has the famous "Peter and the Wolf" and the aforementioned Willie the Whale segments. Melody Time goes all this one better by including two real humdingers among all the fluff, two real classics considerably better than the bulk of the material being animated in Glendale at the time. The main structural technique of Melody Time is that each segment is introduced by the animator's paint brush entering the frame and painting the short into existence (three years before Duck Amuck). 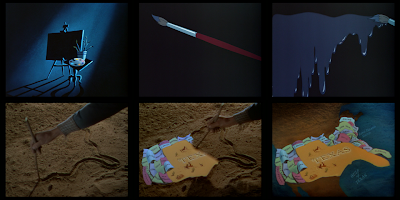 Each short, unlike Fantasia, is preceded by a title card with the piece and the performer of the music, and some even have a bookending technique around the narrative. Like Fantasia, there is a narrator who introduces each short. All of this ensures that the audience is aware they are being told a tale, cued by the text introduction of a recognizable "name", subsequentally hearing the (then recognizable) voice of the name, and this is introduced by an omniscient narrator who only exists between shorts but not within them. "Pecos Bill" is positioned at the very end of the feature and as such its' use of the "famous narrator" gag reaches its' climax in this section, where through Ub Iwerks' effects processes a live action Roy Rogers, his band, an audience and even his horse Trigger are inserted into an animated moonlit prairie. On one hand this may be an effort to accommodate the audiences' desire to see Rogers - the only film star of the bunch - on screen and with his horse, but the placement of his appearance in an animated segment and at the end of the film is a phenomenal climax which is very effective when placed in the whole of the film. The audience is furthermore placed at a remove through the use of at least three bookending techniques; Roy Rogers, displaced famous film star, tells a tale to another audience, which we become, placed as a segment in a larger film, which is introduced to us as such. Pecos Bill, as told by Rogers, is one of the best paced 23 minutes in Disney's animated output, but its' presentation outside of Melody Time compromises the mastery of the short. The narrator announces at the start of the short that we best "sashay on in" slowly, and what follows is a brilliantly sedate section with all the poetry missing from the bulk of the rest of the film. "Blue Shadows on the Trail", a lengthy segment of an extended pastorale of a western landscape at dusk, is structured essentially like a Silly Symphony, complete with extended use of the Multiplane, animal humor, and the gentle touch of a lullaby soundtrack. We then find Roy Rogers and company out in the west, convincingly throwing "blue shadows" across the watercolor landscape, and a dialouge scene ensues. When Pecos Bill is brought up the dialouge subtly shifts to rhyming verse, which begins an extended buildup to the start of the Pecos Bill number proper. As the flat verse enters, so to does the element of song, as Rogers' band, the Sons of the Pioneers, increasingly frequently begin to interject with the three primary songs that comprise the Pecos Bill short: Pecos Bill's ballad, Slue Foot Sue's theme, and the love theme. When the animation begins, it is because Rogers draws a map of the United States in the sand, literally the first drawing in the sequence which creates the animation illusion. The authorial hand, established at the start of the short with the animator's brush, is now transferred to Rogers, who will tell the tale and thus grants the film's segue back to animation. As Rogers' animated film continues, so does the meter of the Sons of the Pioneers' verse increase, until, when Pecos is at full maturity, a real song begins. Pecos Bill himself begins the song by riding into his own closeup and, in an annotation of Edwin S. Porter, fires point blank at the audience. What makes this segment so remarkable is it's relentless pace, aggressive color and constant visual invention. Not content to merley visualize the ballad, Disney animators present a succession of gag which go well beyond the typical Disney"case of the cutes" best exemplified by the Silly Symphonies, ie, the mode of the "Blue Shadows" segment. Now, the humor comes so quickly that Pecos actually establishes his mastery of his Western locale by doing something which never happens in a Disney short - he violates the space of the motion picture film frame, reacting to events in shots which have not yet been projected. In one instance, he reels bandits in from the next shot using a cartoon winch, which forces the screen to wipe as they enter. In another, he shoots the background around him away until he obliterates the shot he's in, signaling the change to the next. The audience is further blocked from embracing the narrative through the animator's constant shifting of the performers of the music in and out of diagetic elements of the frame: a voice heard on the soundtrack may emanate from Bill, his horse, a cow, a bystander, an object, or anything else. It's a simple and simply funny joke, but it frames the entire enterprise as the tallest of tall tales and continues the authorial power given to Rogers. And while Rogers and Company speak for everyone else, Slue Foot Sue and Pecos Bill never speak, and are granted the power Ford assigned to John Wayne in his westerns. After all, they are too legendary to actually be heard. As the segment reaches its' effective end, so does the film, but not without a reprise of "Blue Shadows". While before, the camera tracked left to right and right to left to find Rogers, now it pulls out into a balanced composition. Rogers' song ends, his tale ends, and the musical progression of the piece folds backwards on itself as "Blue Shadows" carries the audience out of the segment the same way they entered: slowly, somberly. The bookending structures are repeated entering and leaving the piece, creating closure which otherwise doesn't exist in television versions which cut the Roy Rogers segment. Just like the music that inspired it, the short follows the inherent unities of the musical suite, the pleasures it provides, rather than those unities which are primarily dramatic. Pecos enters this world and leaves it as a savage among the coyotes and if we feel bad for him at all it is because of the metrical progression of music and image. Bill remains silent. The best shorts of the Post-Fantasias are those not encumbered with a complex narrative or a variety of tones; they tell stories simply and quickly, reach their emotional climaxes effectively, and get out the door at the right moment, not required by the traditional three act narrative structure to hang around when they're not wanted. "Johnny Appleseed' is probably the best thing either Melody Time or Make Mine Music has going for it, because it's disarmingly unpretentious. The best cultural artifacts in the Americana mold have to walk a careful line between becoming self consciously important and remaining innocent, but the Disney animators make it seem like second nature. Americana, in its' oldest and purest form, relies heavily on a larger context whereby the creation of the law, the nobility of the commonwealth and especially the westward expansion are sanctified by God, or a similarly pure cultural figure such as Abraham Lincoln. In general style many of these folk tales are similar to those told in Medieval Europe, where the Devil is constantly being outwitted by the clever blacksmith or tradesperson. The shorts' innocent atmosphere is furthermore conveyed through the animation backgrounds painted in the style of Mary Blair. Blair intentionally skews the perspective in all the wrong directions and reduces the depth of the paintings to almost nothing; everything is stacked right up on top of one another like a Medieval fresco. The style of the backgrounds, simple and geometric in design but richly textured, recall American folk art. And Dennis Day's boyish, clean cut voice as the voice of all the characters in the short including the narrator lends the appropriate air of a simple American fable. The show hits all the right notes. Disney's Johnny Appleseed has the unenviable task of juggling this overt, traditional metaphor with the structure of an animated short which must be as direct and light handed as possible, and it unsurprisingly does it with a little song. Although it's a well known trope of Disney's to use a song to introduce a character's motivations (I'm Wishing, A Dream Is a Wish Your Heart Makes, Once Upon A Dream, etc). Johnny's theme is a whistled, catchy little ditty which is one of Disney's simplest and one of their least labored. My apple trees - they will still be there! We hear this memorable little tune only three times in the short, and each time the whistled bridges between the verses catch the ear of the listener in a way the rest of the songs in the short are not designed to do. The other songs in "Johnny Appleseed" are by and large more traditional "folk" music: the march of "Get On The Wagon", the squaredance of the pioneers at the fall festival, and the rapid meter of "There's A Lot of Work To Do" - the song Johnny's angel uses to motivate him to enter the frontier - are more forgettable. They contain the aggressive meter of marches, forward driving, manifest destiny. "The Lord Is Good to Me" is less a hymn and more a song in the mold of "Whistle While You Work" - a small personal expression by a small man with a big story. It's the last moment in the short and, backed by beautiful images where the orchard of his place of death becomes billowing clouds and sunbeams, it's very moving. But the effect has been achieved through establishing a likeable song and character, delaying the return of the song, and finally bringing it back as an ethereal echo. The Lord is good to me, indeed. Yet we never once are required to subscribe to Johnny's beliefs: the short is the only one in Melody Time to begin with a book opening and as such has, when combined with Dennis Day's bright youthful vocals, the character of a national fable. As in Benet's The Devil and Daniel Webster, the religious theme is fairly submerged in the patriotic theme, and they keep each other in check, allowing a degree of universality to enter. What Disney has actually accomplished here is one of the hardest things a tale about a national character has to succeed in: the passing into history. We get to know Johnny directly and his faith and hope is so carefully judged and presented with such beautiful rural simplicity it's impossible to doubt. His little song does all the legwork of the short and the rest of the piece bides its' time cashing in on what the musical piece accomplishes as Johnny's good deeds pay off. Consider the other viable route open to storytellers: Johnny is immediately established as an major character who will accomplish great things. Far more engaging is the minor character who does accomplish great things. It's the myth of America. "The Legend of Johnny Appleseed", then, is one of Disney's most potent original-source mythologies: the studio head, the most quintessentially American man of his century along with Will Rogers, who so often would earmark Europe's cultural tales for his own expressions, created remarkably few masterpieces about America. Lady and the Tramp for sure, perhaps Summer Magic. Definitely The Legend of Sleepy Hollow. And definitely The Legend of Johnny Appleseed, the light half to that dark tale of American ambition penned by Washington Irving. A good (or at least traditional) starting place when approaching the Disney animated feature films is to begin by classifying the different periods. After all, isn't it easier to compare the relative triumphs of different films if they're all nicely sorted into little bundles? The problem is that, especially when Walt was really monitoring the animation output of the studio, this isn't so easy. The pair of Snow White and Pinocchio are aesthetically matched through the watercolor designs of Gustaf Tenggren and their modernistic adaptations of European mythical antiquity. Cinderella through Lady and the Tramp could be called "reclaiming lost ground", moving into an increasingly realistic, pared down aesthetic. Then we enter the Wolfgang Reitherman / XEROX period from 101 Dalmatians through The Rescuers, etc. These are rarely clean breaks, with the highly stylized and effective Sleeping Beauty perched right between the stylistically quite inert early 50's period and the increasingly lazy XEROX period. Then, of course, there is Fantasia, belonging more to the 1943 - 1949 "Compilation Period" but separated from that chunk of Disney history by the quite aesthetically diverse Dumbo and Bambi. I don't claim to be an expert on those films or much of the animation output by Disney, but one period does strike my fancy: the 1943 - 1946 Compilation Period, comprising two compact miniature movements: the Latin America films and the Post-Fantasias. There are also two double feature films, Fun and Fancy Free and The Adventures of Ichabod and Mr. Toad, each comprising two 30-odd minute short films. These films are remarkable for doing all that Disney wouldn't allow his animation department to do following Snow White: being manic, chaotic, aesthetically innovative, sexual, vibrant and sometimes really really funny. I'll take a dozen Saludos Amigos over any one Peter Pan. What makes these films so remarkable is that they don't shy away from being cartoons: while Disney was intentionally trying to hedge animation away from the thing it's best at (not representing reality) into an area more like moving fine art, receipts just weren't paying off and eventually, the studio was about to collapse after numerous debacles like Fantasia. Then the military took over the studio and, seemingly while Walt Disney was off somewhere worrying about strikes and such, what was left of the animation department quietly began to turn out some really unusual material. What is amazing about these films is that they use animation is a very aggressive way to inform even the traditional cutting continuity of the Hollywood style they're based on. Animation has always been perched on a strange precipice, where things are obviously phony but always reaching towards realism; it is the current conundrum of CGI animation today. The people who best exploited the "fake realism" animation offers was the Fleisher Brothers Studios. 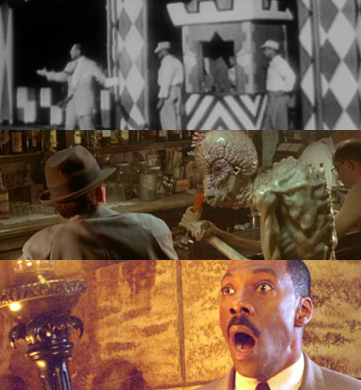 When they rotoscoped over Cab Calloway for their brilliant short Minnie the Moocher, they first showed you a long unedited take of Cab and his band performing the song before the cartoon even started, forcing you to recognize that when Cab Calloway appears in the cartoon later as a ghost walrus, that his movements have indeed been traced over, and that he is furthermore not a character in the diagesis of the story but just Cab Calloway as a ghost walrus. In another Fleisher short, I'll Be Glad When You're Dead You Rascal You, performed by Louis Armstrong, the Armstrong band is established playing at the start of the short as in Minnie the Moocher, but are later revealed to be playing behind the movie screen in the theater when the on-screen cartoon disrupts the screen and it rolls up like a windowshade. These kinds of very aggressive filmic choices, along with those made in the Disney package films and in a certain limited number of live action films, create a new kind of spectatorship. No longer is the illusion of a world existing on screen maintained, but repeatedly and aggressively we are exposed to stylistic and conceptual intrusions which alienate the viewer from the film in a way which forces them to accept the film as not a narrative, but a series of choices performed by a conscious craftsperson for their benefit. The stylistic mode of Hollywood which evolved more or less accidentally is no more intrinsically valid than any other cinematic mode of representation; it's just the one whose compositions, patterns, and basic structures took power and held power. Much like any other language, literal or figurative, viewers are exposed to one way of doing or saying things until only that mode is truly comprehensible. In film studies we thus call the Hollywood-Griffith-Porter school of cutting continuity the Institutionalized Mode of Representation. Filmmaker Peter Watkins, who brilliantly used the style of news reports and news reels to fictionalize the nuclear attack on Great Britain in The War Game, takes the phrase one step further and calls in the "IMR" the Monoform, to make transparent the stifling artistic sameness of much of our modern media. Although it's pretty hard to make the converse argument that the Disney films (or any film created with mass appeal in mind) are honestly, diametrically opposed avant-garde experiences, I think a middle ground does exist, where the viewer is allowed the narrative-style pleasure experience as well as a conscious artist, "New Spectatorship" kind of experience. Micheal Powell, who directed some of the best of the authentically artistic narrative films, called this the "Composed Film", specifically referring to his aesthetically dazzling The Tales of Hoffman, which does everything you can do in films in one two hour film opera. This idea of the "Composed Film", of a film where the audience is made aware of choices made by a filmmaker through very brauvera movements and moments, might be identified as the alternative to the "Imposed Film" - the Hollywood style where all distractions are minimized. Moreover, if we subscribe to this idea of a composed film we can drag in a surprisingly diverse number of sources - Fritz Lang, Sergei Eisenstein, F. W. Murnau, Charles Laughton's Night of the Hunter, Max Reinhardt's A Midsummer Night's Dream, and countless others have sought this "Composed Film" aesthetic to very different ends throughout film history. Many have expressed their admiration for the efforts of Walt Disney, maker of the most extreme "Composed Films" in history, where every moment must, by definition, be a choice. This legacy is apparent from Reinhardt's Midsummer being a conceptual predecessor to Fantasia and through to Powell and Pressburger's Hoffman being a clear continuation of its' ideas. This "Composed Film" is most acceptable to a mainstream movie audience in small doses, mainly short films where such ideas can be expressed in moments of singularity. 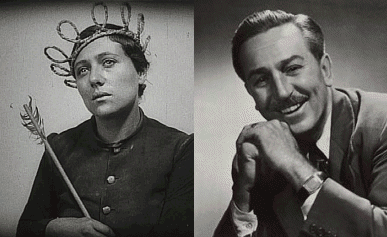 And the Disney package film are composed entirely of short films, usually focused on a singularity of purpose. Rather than being based on question of narrative resolution, they are structured on things like color, meter, music, or rhythm. The narrative is usually of little importance and is, in fact, something of a non-diagetic component in the larger film. A few years ago I wandered into the Virgin Megastore in Orlando (OK, OK, actually Downtown Disney) and saw something I thought I'd never see: a used, almost mint copy of the Walt Disney Treasures tin Disneyland, USA. I totally missed the boat on this in 2001 and hadn't thought much of it, but here it was for $17 and oh yes it was mine! I was so excited I immediately bought David Cronenberg's Naked Lunch, then plunked down $8 and saw The Haunted Mansion on the big screen. This succession of events was sufficiently ridiculous to be lumped together that I'll probably never forget them. Then, in mid 2004 and late 2004, the utterly essential Wave Three and Four of the Treasures was released, and I fell in love. Over the next few months I began collecting all the Treasures I was interested in (I'm still missing Behind The Scenes at the Walt Disney Studios, but it's one of the cheapest ones available on the second market despite the fact that The Reluctant Dragon is capital A Awesome), and I find them to be quite an invaluable line of releases. In 2005, one of my most anticipated DVDs was to be Disneyland: Secrets, Stories, and Magic. It was to be released in July 2005, and I drove to Downtown Disney at 9 in the morning to be the first in Once Upon A Toy to buy it. They didn't get it. After spending a few hours wandering around in frustration, I returned home and finally discovered that it had been delayed - until the end of the 50th celebration. OK, I can wait. Then it was never announced. And then, in 2006, the silly looking Walt Disney Legacy Series was announced, and everyone knew the writing on the wall: Disney Treasures was effectively dead. This was confirmed when Destino, Oswald the Rabbit, and the much neglected Disneyland: Secrets and Stories was announced to be in Wave 2 of the WD Legacy Series. Then, suddenly, the effing LEGACY SERIES was cancelled, probably due to poor sales of the True Life Adventure films (the DVD cases looked silly and confusing, is my big theory), and nobody knew what to do. Wave Seven of Walt Disney Treasures was actually announced, and they weren't fooling me when Disneyland: Secrets and Stories was included. I knew they couldn't possibly actually be releasing this. I even thought for a moment about not buying it out of spite until they announced that People and Places: Disneyland USA would be included, and I went apoplectic. If you've never seen People and Places: Disneyland USA... well, by now everyone can, but I've been watching a bad bootleg of it for years, split into two AVI files, and furthermore significantly different than the theatrical version included here. The version I've been watching was shorn of at least ten minutes of material but they did, strangely enough, revise the Jungle Cruise segment so it included a strange man with a megaphone and a more complete trip on the 1956 ride. I think this was done for a television airing. Regardless I thought it was an amazing little film until I found out it was originally filmed in Cinemascope and, well, I went bonkers. Now in it's proper aspect ratio and nicely restored and on those little shiny discs which have been my financial ruination since 1998, watching it is like eating a million Vanilla-Pineapple Dole Whips all at once. It's that good. I still haven't watched the feature documentary, but I paid my $25 for this and this only. Imagine my shock when other really great stuff was also included! Thanks to most of the stuff on the second disc not being mentioned in the press release, this two disc set has been bumped from pretty awesome to absolutely essential. If you HAVE to get only three Walt Disney Treasures discs, it's this one, Walt Disney on the Front Lines, and The Complete Goofy. Now I can ditch my bootleg copies of Disney Goes to the World's Fair, The Golden Horseshoe Revue, and Disneyland Around the Seasons which I never really liked but which I'm not about to turn my nose up at having.. ! But the thing that really knocked me for a loop is an (again unannounced) 30 minute feed of time-lapse photography of the construction of Disneyland, hidden away in the Bonus Features menu, with pleasant commentary by Tony Baxter (master of rocks) and friends. This footage is amazing, and even more astonishingly, was discovered in a Pennsylvania salt mine! I don't know if that beats The Passion of Joan of Arc being discovered under a rag in a Norwegian insane asylum, but it's close. Greed or The Magnificent Ambersons. Back in 2003 when I finally pried open Disneyland USA I was disappointed at how lax the DVD set really was. Disneyland After Dark was edited, the pictorial quality of the discs was so-so, and there was nothing except those Disneyland episodes. Well Disneyland: Secrets and Stories is exactly what I wanted Disneyland, USA to be. Please immediately improve your weekend and go buy it now. If these sell out it means the good cause of the Treasures Tins could continue yet another year. Whenever close analysis is attempted of themed environments on any scale, the question ultimately arises as to what constitutes a “success” or “failure” on that level. Although it is often difficult to “read” the overall intentions of an area, it is undeniable that certain areas invite and excite a sensation of satisfaction and suspended disbelief more successfully than others do: nobody will contest, for example, that Disneyland’s 1983 Fantasyland is more inviting and appealing than The Magic Kingdom’s 1971 Fantasyland. I have come to the conclusion that much of the overall appeal of these successful spaces can be loosely and poorly described as a “stratifying” effect on the viewer’s perception of the thematic space. This is not so abstract as it sounds: where one feels that, for example, an exceptional themed environment like The Magic Kingdom’s Adventureland could potentially go on forever, a less successful area feels more limited in scope. So while Disneyland’s Frontierland terminates rather anticlimactically in the Rivers of America, one feels they could walk on into the wilderness and keep walking forever in the current incarnation of the Magic Kingdom version of that same area. All those beltways of roads and railroad tracks just out of sight beyond the berm seem to melt away. The most successful themed environment ever constructed for a Disney park is also one of the smallest. 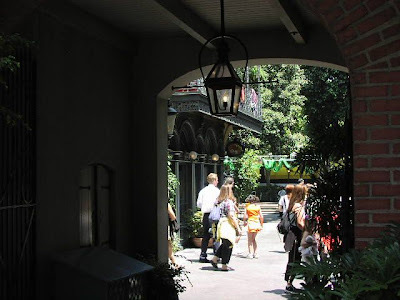 New Orleans Square is the last themed environment to feature the direct guiding hand of Walt Disney himself; it is also unmatched in the American parks for beauty, elegance, atmosphere, and that intangible element of stratification. If these successful “lands” immediately establish a kind of visual grammar that the spectator will apply to his or her exploration of the area, then New Orleans Square takes ample advantage of its limited space by presenting most of itself to the attentive viewer at a single glance: a tall stack of ornate structures comprising two full city blocks jutting out of a curving backdrop of similar buildings; a shaded park with a railroad station, and a plantation Mansion. It can be photographed in its entirety from its northward boundary to its’ southward boundary from Tom Sawyer’s Island. Although not part of the original designs, this “visual grammar” is immediately apparent from your first impression of the square no matter from which angle you approach it; it is defined by the “Pirates courtyard” dug in the late 1980’s to alleviate traffic congestion. This beautiful succession of curving lines presents an arc of bridge that allows you to travel level with the ground, passages under to the recessed courtyard beyond, and two great swooping lines up to the Disney Gallery above the attraction. This architectural flurry of lines says definitively that in this area, you will travel both above and below the surface of the earth. While these five curving lines add visual interest, they effectively intensify the verticality of the Square: situated higher than the other Disneyland areas, with more levels, it begins to resemble a very tall sandwich. New Orleans Square is also unique in that it situates its’ high volume pedestrian area as far away from the bulk of the area as possible: one may pass by the Square without actually passing through it, and this is a uniquely high amount of waterfront footage. So, in order to experience the charm of New Orleans you have to enter and go exploring. Essentially composed of six large structures, once inside the Square itself nothing seems to exactly parallel any other building: the casual wanderer loses her bearings on where each building rests in relation to the other. Addtionally, the pedestrian walkways commonly narrow down to their slimmest possible space while still being able to cram 40,000 people through a day: the overall effect is of an exploration rather than a quick jaunt on the way to Splash Mountain. The effect is aided by a remarkable succession of eateries and shops; even Main Street USA pales in comparison to the staggering variety and quality of the commercialism per square foot on display here. Smaller touches add to the overall effect that this area multiplies in layers into infinity: two beautifully dressed tiny courtyards do not give the effect of being mere transitional spaces between shops, but beautiful discoveries exclusive to the tourist that finds them. Each and every space encountered is richly dressed – although the One of a Kind Shop has been gone for many years, there still seems to be a staggering amount of real antiquity on display here. From upper windows recorded vignettes are played out to the attentive listener as the auditory backdrop to thematic arrangements of props along these upper balconies: the lady with the bird, the voodoo lady, and the artist painting the river have become characters as recognizable to Disneyland fans as signifiers of this area as the Ghost Host or the pirate auctioneer. clarifying the architecture as well as making the tableau look more visually complex than it really is. 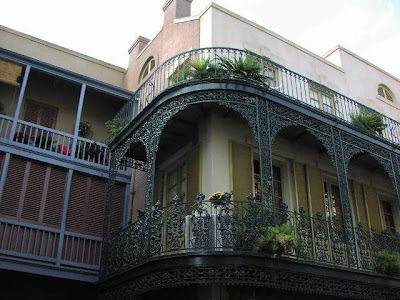 This stratifying effect is useless without attractions to anchor it, but New Orleans Square has the two greatest themed attractions ever conceived as its’ anchor. It is important to consider just how well The Haunted Mansion and Pirates of the Caribbean fit into the area: the astonishing pedestrian space is, after all, a very complex way of hiding these two huge attraction show buildings from the public. The Square grows in richness once you add Pirates and Mansion to your understanding of the vertical space created by the area: just below the feet of the pedestrians, boats are flowing through a windswept grotto full of decaying pirates. The effect is enhanced by the fact that these scenes are actually under the area, and once one calculates that she can not only go up three full levels, but also down another five, does the full scope of the area become clear. New Orleans Square is fueled by a strange sort of romanticism. Although clearly influenced by the “romance of the magnolia”, Disney redefines this essential American myth into new territory by introducing into it a dreamlike sense of magical forces at work, many of them sinister. Once inside Pirates of the Caribbean and The Haunted Mansion, day fades away to night and visitors are drawn deeper and deeper into dark labyrinth-like spaces by omnipresent forces and often against their will. Guests essentially find a particularly dank and forgotten portion of the bayou and are sent down a waterfall by a ghoulish living Jolly Roger in Pirates of the Caribbean, only to subsequently stumble on a horde of cursed treasure that sends them back in time. The Haunted Mansion’s Ghost Host lures you into a windowless, door less room and offers you suicide as a means of escape. Both attractions are frontloaded with death imagery both grotesque and comic: the pirates are out of view until we come upon only their dilapidated remains, having met an unpleasant end in pursuit of riches. The Haunted Mansion’s door-less chamber is essentially a catalogue of potential fates for the unwary visitor… funny but unsettling, because there is actually no escape in sight. These two attractions orbit each other in maddening circles both intentional and unintentional. The Haunted Mansion is overloaded with seafaring visuals: a sailing ship weathervane, a captain’s spyglass pointed back towards Pirates on an upper level of the façade, the ghost schooner portrait hanging in the portrait gallery. The way Marc Davis painted a portrait of a young lady hanging in the hideout of the pirates in the first half of Pirates of the Caribbean recalls a piece finished long ago for the Haunted Mansion of a woman becoming a stone medusa. 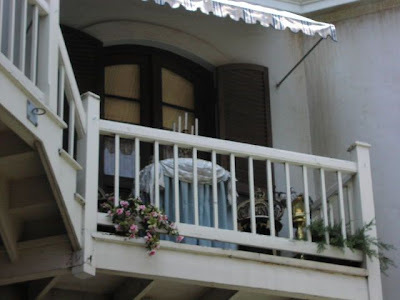 Popular Disneyland legend pegs this medusa lady as being a Voodoo queen who really did live in New Orleans in the first part of the twentieth century; and the Voodoo lady’s balcony in New Orleans Square is si tuated halfway between Pirates and Mansion. And, of course, it takes a certain kind of creative genius to fill an attraction about pirates with so much nautical mystery and superstition. The arch is redefined by New Orleans Square into a central motif: a signifier both of very ancient design and of transitional spaces. The experiences of Pirates of the Caribbean and The Haunted Mansion can be basically refined to incessant movement through a succession of arches, always towards apparent increasing danger. . One moves both towards and away from danger through multiple arches at the very start and end of Pirates of the Caribbean, and the Haunted Mansion’s rooms are mostly divided by Victorian arches. The arch, especially in the context of the Old South, is a signifier of death: tombstones and crypt doors are defined by arches. Even outside the attractions, reminders of the staggering amount of death imagery found in the area is constant, from the ghoulish chants of the Voo-Doo Lady high above, near the train station, to a tiny and unmarked crypt along the shoreline of the Rivers of America. It is small and uncommented upon. The keystone for Disneyland’s conception of the Old South is the Blue Bayou, and it is the true heart of the area: so important that it is essentially considered its’ own attraction that guests pass through on their way to Pirates of the Caribbean. Of Disney’s “indoor-outdoor” spaces, it is the most perfect. Constructed not as a block, as later attempts will be, but a pure wide open panorama which must be viewed through a thick cluster of (mostly fake) vegetation, the area is built not for the boats traveling through it but for the nearby inside eatery that looks into it. No matter what the noise level, the bayou always seems calm and serene. It starts Pirates of the Caribbean out not on a bang, but on a moody lament. Out of this mire of conflicting ideas of high culture, vulgarity, hidden demons, and moonlit romance emerges the premiere themed area of Disneyland. The net effect is that it’s simply impossible to see and do everything New Orleans Square has to offer. The more details one percieves, the further back the intangible formula for success retreats. But perhaps, ultimately, it’s simply because Walt Disney had more ideas for the area than it could possibly contain. Every space has his personal signature of quality of it, needed or not: from his private apartment overlooking the Rivers of America to his personally purchased, antique, utterly inoperable espresso machine in Café Orleans. Of the four chief architects of the area – character designer Marc Davis, show scene and layout men Claude Coates and Herbert Ryman, and master dreamer Walt Disney – it is Disney’s overreaching goals that succeed above all. New Orleans Square is too much for one bend in the river, but, taken as a unit, it is a high water mark of what theme design can do. I wrote this piece three years ago now; back when I was trying to write my book all in a go and now, looking back, I realized that had I actually finished it, it would've been a more appreciation-based effort than the analysis I'm trying to do here now. It also would've been the most florid trash; I've cut half of my overladen romantic prose out of this and it still embarrasses me. But it was the first time I started naming things that places do, which is worth sharing. Appreciation and analysis needn't be two unrelated approaches, but I find that much of the Disney online community stops dead at appreciation and never goes over into real analysis. Which is fine, because saying "X exists" is two thirds of "X exists because", and is still significant. I say: don't tell us that something's there, tell us why it's there. Then we'll start cracking the old chestnuts and getting somewhere. Anyway I hoped you liked it. I'm getting burned out on talking about the parks so expect some filmic analysis post here through December.